During March 2016, the Bodhi Shrawan Dharma Sangha held a small but very beautiful World Peace Maitri Puja event in Sindulpachowk, Nepal. For those who attended the Puja, we saw a number of beautiful events unfolding before our eyes with the introduction of the new Maatma Marga Guru’s and with the chanting of the Maitri Prayers. Guru also gave a speech on the first day of the Puja and this will now need to be translated and prepared for publishing on maitriya.info in the coming months ahead. 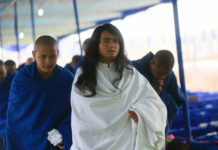 Even though this event was very small, there were many of us international sangha who could feel that there was something very special taking place during this puja. And as you can see here from the small selection of photos, we were all very happy to help out with the organising and preparations! There were lots of happy faces, beautiful blessings and offerings being made to our blessed Guru – Maha Sambodhi Dharma Sangha during this 3 day event and we would like to thank everyone for making this beautiful Maitri event possible. We now wish to share this beautiful experience and feeling with all of our international brothers and sisters who couldn’t be with us for this beautiful event and we sincerely hope that you will join us again next year for the Maha Puja in Bungamati!